The chart on the left compares a group of 147 leading industry analysts according to their individual profile in the media and their impact on high-value sales. 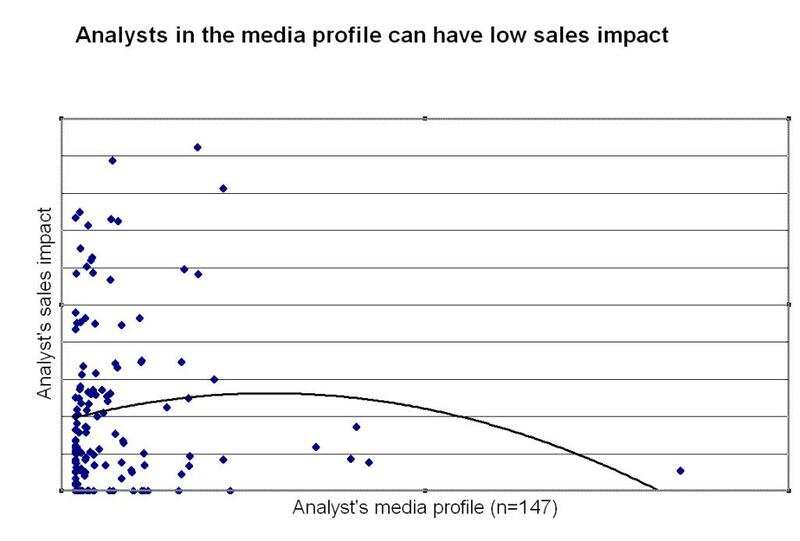 The black line shows the trend in the data: after a certain point, higher than average profile in the media is correlated with lower than average impact on sales. It’s one of the findings for an Analyst Impact Modeling project we recently completed for a client. Because the number of analysts was modestly large, the chart gives a good example of the pattern we see in many market segments. Over time, however, we are seeing a slight change in this curve. It’s peaking further to the left and dropping down further to the right in a number of industries, suggesting that media profile is a less and less good predictor of analyst influence on high value sales. Partly this is because analysts’ profile in the media are becoming much more uneven: the leaders are stretching further and further out in front of the pack. Often, that is partly because of vendors and agency support in promoting the most positive analysts. Of course, low value sales [consumer technologies] show very different trends; someone might follow the guidance of a newspaper or magazine when they are buying an MP3 player, but perhaps not when they are spending $1m or $1b on a make-or-break purchase for their business.